sitting in front of the brick fireplace surround. It looks natural and lovely. But because it's made with natural materials, it seems perfect for the season. When the end of season rolls around (for me, the day after Thanksgiving, late November), rinse the legumes and grains well, then cook up a ginormous pot of soup, or, don't rinse just yet, but divide into 2 portions to store (and rinse just before cooking), and make a not quite ginormous pot of soup, twice, at a later date. This takes me about 30 minutes, including going outside and finding the branches, and cleaning up the vase. Wrap the bottom 6 inches of the branches with plastic wrap. This is to prevent any sap from damaging the beans. 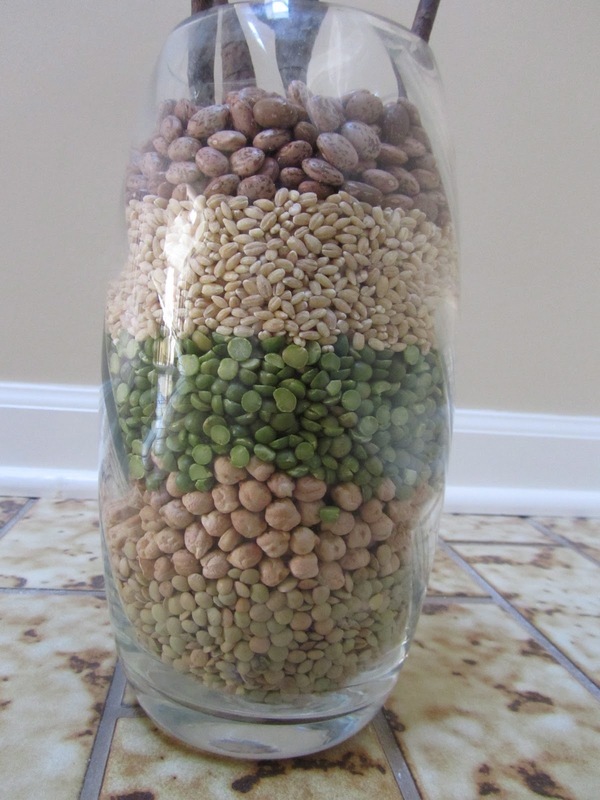 Begin layering your dried beans into the vase. When the vase is half-filled, insert the wrapped end of the branches into the beans. Using a cupped hand, carefully pour the remaining layers of beans and grains into the vase, until about 1 inch from the top edge. 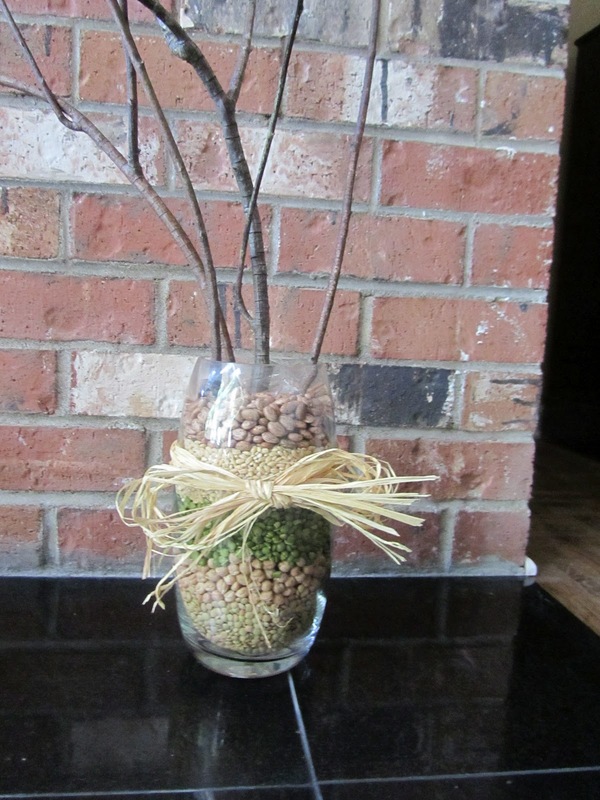 Tie your raffia or ribbon around the branches or vase, trim the raffia ends, and you're done. If you have small children who like to put things, like beans, where they really shouldn't go, set this on a shelf or mantle, where they cannot reach. The same goes if you have pets who may like to paw through the contents. Simple, natural, and attractive. Nice touch of wrapping the sticks to keep the beans clean. Of course, my cats would be all over this with the branches and raffia to play with until they found the beans when they knocked the jar over. Then they would really have fun. I thought about your 4 cats as I was making this, and how much fun they'd have while you and your family were away at work and school all day. We had a cat who would regularly paw out all the potting soil from indoor plants. I can only imagine your 4 darlings and what they'd do! Beautiful! I'm in autumn decorating mode, too. I'm all excited because Aldi's has pumpkins (jack-o-lantern, not cooking pumpkins) on sale this week for $2.50. Out here that's a tremendous bargain! thank you! Oh, I can't wait to get pumpkins. $2.50 sounds like a good price, actually. I've been seeing them around here for $2.99 when pre-priced, or 29c per pound when sold by weight. I bet your kids will get excited too, when they see the pumpkin. And for what it's worth, I cook the jack-o-lantern type pumpkins, too. They're just a tad watery and you have to cook for longer (or drain off liquid). That's such a great idea, I have everything already, minus the plastic wrap, I just have to try this!! projects that I have everything at home for, are my favorite kind! You could also try waxed paper, or a scrap of fabric, if wrapping the branches is a concern to you. But I also think you could just not wrap them. I just didn't want any sap to get on the beans, as I intend to use them later. Glad you liked it!